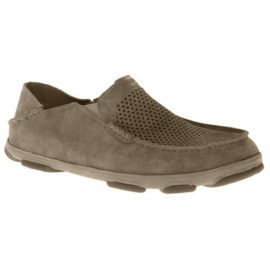 With premium leather and a breathable upper, the Moloa Kohana&apos;s deconstructed look defines casual style. Elastic gore fit panel, hand-sewn stitching, embossed logo detail, and Kohana signature red outsole hook logo. This best-selling men’s style is a perennial favorite. Rendered in soft water-resistant suede and fully lined with natural wool, the Ascot is a slipper you will want to wear everywhere, which—thanks to the durable rubber sole—you can. Crafted from luxe leather and Twinface, the Byron is a wear-everywhere slipper. A plush wool lining keeps feet cozy while a molded rubber sole does double duty, providing traction in and out of the house. 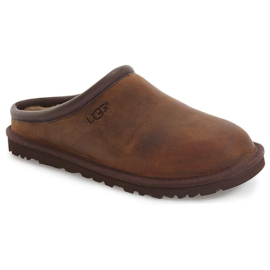 Constructed of soft leather with a roomy round toe and an EVA cushioned sole, this classic clog delivers unbeatable comfort everywhere you go. The soft, cozy lining is made from plush UGGpure™, a textile made entirely from wool but engineered to feel and wear like genuine shearling.